August 2-4, I once again had the privilege of preaching along with Dr. John Goetsch in WV at the Student Prayer Advance hosted by Evangelist Harold Vaughan. It was great to see Brother Vaughan, who although has been battling cancer, was still executing his vision for revival among today's teen's and college students. Two more nights to go. God has greatly blessed us this week with His presence and power! It has been a blessing to be with Pastor John Flanders. 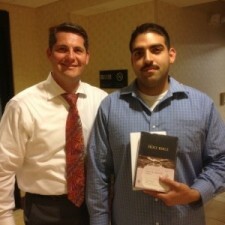 He is doing a phenomenal work with a passion for revival! Praying for the designated evangelistic service tonight. Browse our website to find out more about Evangelist Billy Ingram.